"Michigan team was able to trap a single atom within an integrated chip and control it using electrical signals." Except I've heard it wasn't really a scientist... OK, it was me. And by working late, it means 5 p.m. The opinions expressed on this page are those of the author, and very likely no one else. The "All These Worlds" Space Blog is maintained by David Hitt. Be sure to check out the full blog. Following up on recent discussion aboud rumored possible names for NASA's next generation of spacecraft and launch vehicles, Cosmic Log suggests that the new Apollo-esque CEV capsule should be named, well, Apollo. Since I don't know what my blogging status will be while I'm out of town the latter part of this week, I'll go ahead and mention this bit about Friday's spacewalk. Among the tasks scheduled for the EVA is throwing an old space suit overboard, making it an independent satellite. (And, yeah, that link is one of my stories.) The suit will have a ham radio transmitter, allowing folks on the ground to hear prerecorded updates and state reports as it eventually deorbits. Today is the 20th anniversary of the loss of the space shuttle Challenger and her 51-L crew. All week long, I've felt the burden to write something really meaningful for the 20th anniversary, to come up with a fitting tribute to whose who gave their lives. But, I just can't do it. Part of that is, since, for the past three years I've been much more serious about writing an anniversary piece, I feel like I've said a lot of what needs to be said. Granted, those things need to keep being said. (The events of three years ago show the high cost of believing the past can be left in the past.) You're welcome to go back through the archive and read those pieces. Part of it is that I've put such an onus on myself to write something worthy that I've set an unreachable standard. Even without the additional burden of a major anniversary, there's no way I could write something worthy. Part of it is that I've always taken these pieces as an opportunity to put past, present and future in the context of each other, and right now, the emotions I feel about the future of spaceflight are too complex to be boiled down to be dealt with that manner. Never have I been both so excited or so nervous about the future of exploration. And, to be honest, as much as I hate to admit it, part of it is that I can't stop thinking about the anniversary in the context of my life. Twenty years. I was 10 years old; a student at Huntsville Middle School. I'm now three times older. So much time has passed. I still carry the indelible memory, though I have little in common with the person into whose brain the memory was burned. But the lesson there is this -- we go forward. Their loss is a moment frozen in time. In his day of remembrance letter to the NASA family, administrator Mike Griffin borrowed words from Abraham Lincoln; words that are worthy for the occasion. At Gettysburg, Lincoln said, "It is rather for us the living, we here be dedicated to the great task remaining before us--that from these honored dead we take increased devotion to that cause for which they here gave the last full measure of devotion--that we here highly resolve that these dead shall not have died in vain ..."
Godspeed the crews of Apollo I, Challenger 51-L and Columbia STS-107. 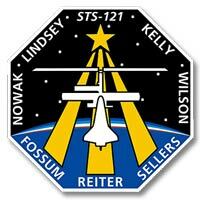 Godspeed the crew of Discovery STS-121. Godspeed those who will return us to the moon, and represent humanity on worlds beyond. To honor the past, we must never stop looking toward the future. Today is NASA's Day of Remembrance, in honor of those who have given their lives for the cause of human spaceflight. Ah, those Russian space organizations. With China quickly becoming a major competitive spaceflight player in terms of hype per accomplishment, the Russians are really having to ramp up their efforts. From today's Space Daily. Starting with the more mundane, there's exciting stuff coming for the international space station, which is "evolving into an international space port." OK, sure, I can believe the sentiment, if the phrasing is a bit over-the-top. More impressively, Russia is going to double the number of Soyuz launched beginning next year in order to increase ISS crew size to six. Uh, OK, if they say so. It could happen, but only with an increase in outside investment. Which could happen -- with the current situation, Russia has the ability to tell other nations, we can carry you up to spend time on the space station you've helped build, but you gotta buy your ride. 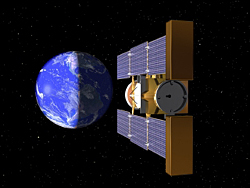 Further down the road, the Kliper spacecraft will begin crewed test spaceflights in 2013. Again, that's great, but where is the money coming from? Russia has practically gone around hat in hand seeking international funding for Klipper (if you prefer that transliteration), but so far has no commitments. Again, it could happen. Oh, and one more thing -- Russia is going to build a permanent base on the moon by 2015, and be mining He-3 there by 2020. Uh, well, good for them. With what, exactly, are they going to do this? See, that one's just silly. But, it does top China's silly lunar ambitions by a couple of years. This is going to turn into a wacky international space version of Name That Tune. "OK, I can land on that moon by 2017.' "Well, I can land on that moon by 2015." "Well, I can land on that moon by 2012!" Until finally we get to, "Well, I can land on that moon next year!" "OK, land on that moon!" "What, did we say moon? 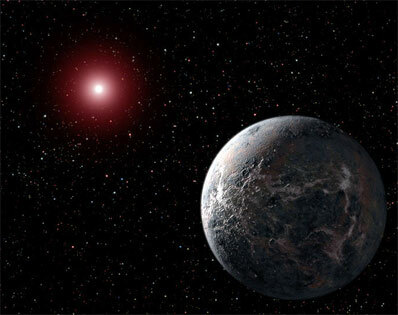 We meant ... uh ... not the moon..."
Maybe I'm just cynical, but I'll be glad when we manage to start imaging some more of these extrasolar worlds that have been found. Announcements like yesterday's about the discovery of a small extrasolar world with a five-Earth mass are exciting, but, probably largely due to my utter lack of scientific understanding, I have to wonder whether there are other phenomena we're not aware of that could be responsible for some of the minor eccentricities that are attributed to planets. Still, assuming they are right about this one, it sounds like it's exciting news about the presence of other rocky worlds in the galaxy. 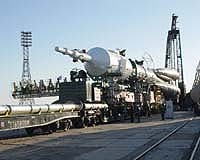 Russia's space agency has postponed the launch of the next manned mission to the international space station by one week, to March 30, a spokesman said Monday according to the ITAR-Tass news agency. The launch, which had been scheduled for March 22, is to carry Russian cosmonaut Pavel Vinogradov, American Jeffery Williams and Brazilian Marcos Cesar Pontes. The report cited Roskosmos spokesman Vyacheslav Davidenko as saying that the launch was postponed because problems were discovered with elements of the spacecraft's control system, and that parts would have to be replaced and fully tested. When the next astronauts walk on the Moon, they may be taken there in spacecraft with the names Antares, Artemis and Ares, sources close to NASA tell collectSPACE. Unlike during Apollo, when crews gave mission-unique monikers to the command and lunar modules (e.g. Columbia and Eagle), NASA's new spaceships would retain their titles between flights, advancing only by number (e.g. Ares-1, Ares-2). Citing mission planning documents internal to the space agency, the Crew Exploration Vehicle (CEV) would adopt 'rival to Mars' Antares as its title while the Lunar Surface Access Module (LSAM) will be Artemis, the Greek's twin sister of Apollo, goddess of the Moon. 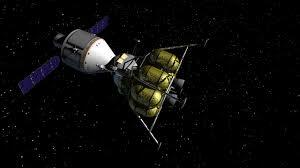 NASA's heavy-lift rocket will be Ares, the Greek's take on the Roman Mars. That said, I would note that all of this is a long way off, and thus subject to change. To be honest, I didn't even realize that Opportunity had not been roving for the past couple of months. I'd reported the problems with its robot arm, but didn't catch that the team was continuing to work on that while the rover stayed in place. Anway, though, Opportunity is now rolling again. On Wednesday, Opportunity will be two (Earth) years into its 90-day mission. 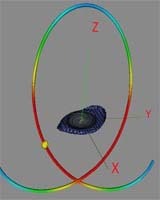 Astronomers are saying that debris discs recently discovered around two nearby stars look much like our solar system's Kuiper Belt, and lend support to the Nemesis theory that our sun has an undiscovered dark companion. For the first time, NASA is seeking non-government vehicles and commercial services to provide crew and cargo transportation for human space flight. The final announcement for Phase 1 of the Commercial Crew/Cargo Project invites proposals for Commercial Orbital Transportation Services Demonstrations. The companies or teams selected will develop and demonstrate the vehicles, systems, and operations needed to support a human space facility like the International Space Station. Once a capability is demonstrated, NASA plans to purchase these services competitively. They'll be trying again at 12:08 p.m. CST today. This rocket will be the largest Atlas ever and is supposed to be the fastest ever, boosting New Horizons to the orbit of the moon in like 8 hours (a trip that took days for Apollo). I'm not sure what that will mean for the launch; whether it will be visibly faster or not. Anyway, you can watch on NASA TV, which is also broadcast on the Web. NASA Administrator Mike Griffin said Tuesday he is confident the shuttle fleet will return to flight in May or July, and then fly regularly enough to finish building the International Space Station before the orbiters retire in 2010. Griffin said the agency is close to picking a target date for the launch of shuttle Discovery on the second post-Columbia flight. Srubbed again, due to a power outage at APL. The forecast for tomorrow is calling for an 80 percent chance of acceptatble conditions. NASA's giant crawler transporters marked their 40th anniversary Friday. The crawler was first used in January 1966 to move the launch umbilical tower for the Saturn launch pad. Lucky media got to tour the crawler while it was in motion during the anniversary event. Addendum: Per Aero-News: "They were originally seen as something of a folly, with no less an authority than Walter Cronkite stating they might never work. ... Crawler Transporters 1 and 2 -- known colloquially by NASA scientists as "Hans" and "Franz" -- are still hauling..."
The first mission to the last planet is only hours from launch. NASA's New Horizons spacecraft is scheduled to launch for Pluto at 12:24 CST today. A this time, things are looking good for launch. 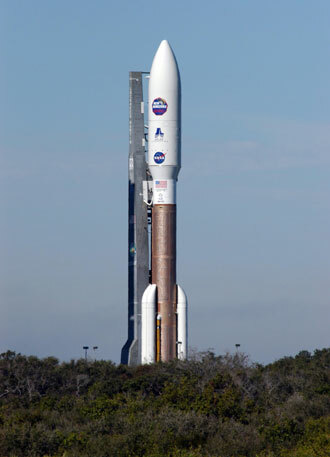 After launch, New Horizons will take over nine years to reach its destination. On 12 April 1961, Yuri Gagarin was the first human to see the Earth from space - to realize its awesome and fragile beauty. Yuri did not see lines demarcating countries or the conflicts between people. He did not see our problems or our achievements. What he saw was a magnificent planet, a tiny oasis in space, the home that we all share. 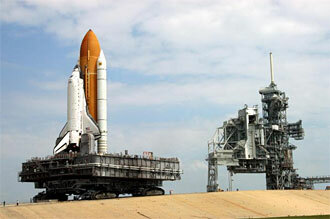 20 years later to the day, the US launched its first Space Shuttle, Columbia and opened the door to space even wider. Many cosmonauts and astronauts have returned from space with a new awareness of how small the Earth really is, how important it is to protect it, and how we must put aside our differences and work together. It is this spirit of space, the possibility of cooperation among nations to explore, learn, and be inspired, that we commemorate with Yuri's Night. People of the world, join together and celebrate! April 12th marks the anniversary of the dawn of a new era. And now it falls to our generation to make the next mark on the pages of human history. For more information go to http://www.yurisnight.net/. Yuri's Night is organized by the international student-run organization Space Generation Congress. After almost seven years and billions of miles of travel through space, the Stardust spacecraft is about to come home. When it passes by Earth on Jan. 15, 2006, it will bring with it an incredible souvenir of its trip -- samples of comet and interstellar dust. On Jan. 15, Stardust will return to Earth. Stardust will return its interstellar cargo by releasing a capsule containing the samples previously collected. A parachute will be deployed allowing a soft-landing safely back on Earth. The samples will land at the Utah Test and Training Range, where a ground-handling team will be eagerly awaiting their arrival. Scientists believe the samples Stardust returns will provide a unique look into the building blocks of our solar system and could help unravel mysteries surrounding its birth and evolution. Cosmic Log has an article today about the "how many planets" issue, with feedback from readers giving their opinion. I, of course, have been saying I don't think 2003 UB313 should be considered a planet, and that the only argument for keeping Pluto as a planet is that it's been on the roster for 75 years. The problem that raises, of course, is that how do you say Pluto's a planet but something larger is not? Virgin Galactic is making rumblings about SpaceShipThree again, saying Virgin and Scaled will cooperate on development of the orbital vehicle if the SpaceShipTwo-based suborbital spaceline is successful. No word on how long Virgin Galactic will have to make flights before it's considered enough of a success for a decision about SS3 to be made. NASA's Constellation Program is making progress toward selecting a prime contractor to design, develop and build the Crew Exploration Vehicle (CEV), America's first new human spacecraft in 30 years. 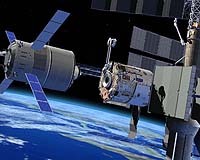 For the first time, the Phase II Request for Proposals specifies a configuration for the spacecraft: an improved, blunt-body crew capsule shape. Requirements are based on future exploration mission needs and the desire to fly the first CEV mission as close as possible to 2010, when the space shuttle will be retired. Phase I resulted in contract awards in July 2005 for CEV systems requirements definition to teams led by Lockheed Martin Corp. and Northrop Grumman Systems Corp. Phase II proposals are due March 20, 2006. After nearly 50 years, astronomers have figured out what causes the mysterious and periodic warping of the structure of the Milky Way galaxy: The Large and Small Magellanic Clouds are interacting with the galaxy's dark matter halo to magnify their gravitational influence, creating the warps as they orbit their parent in a cycle that takes about 1.5 billion years. ... my reaction, based on my level of understanding, is basically: "Oooooh, science." After last month's failure of the Falcon I rocket, SpaceX has shipped a new first stage to the launch site and is preparing for a new launch attempt on Feb. 8. You know, I've never watched a single season of Survivor. Don't think I've seen two minutes of any episode of the 500 seasons so far. Not the original, not Survivor: Marquesas, not Survivor: Wal-Mart Supercenter, none of it. But that may be about to change. The next season of Survivor will feature retired astronaut Dan Barry. Survivor: Panama premieres on Feb. 2 (while I'm in Houston, unfortunately). It'll be interesting to see how he does. On the one hand, he's very smart, and has been through survival training. On the other, NASA protocol may have rid him of the necessary deviousness. Given my general distaste for watching broadcast TV, I'm not sure if I'll actually watch or not; particularly since doing so would generate mixed feelings for me regarding his performance. In general, I'm all for him winning, but since I'd only watch for as long as he's on, a part of me would be waiting for him to lose. OK, a bit of a pet peeve here, so feel free to tune this one out. There some good Mac and Trek stuff below (unless you're reading the space-only version of ATW, in which case you're missing out, and should immediately flip over to the full version). Anyway, SpaceDaily enages today in some gleeful NASA bashing today echoing an argument I've heard elsewhere that NASA agreeing to buy Soyuz vehicles from the Russians showed that they had no choice but to do so. I've seen this presented as an argument of the failure of the shuttle program and that NASA has bottomed out. The truth, though, is just the opposite. NASA did, indeed have other choices. Most obviously would be to simply not have Americans in space until the shuttle was ready to fly again. It certainly wouldn't be the first time America was completely grounded. The other option would have been to go with a "good enough" approach to safety -- fly longer ISS expeditions exchanged via spaced-out shuttle flights, decreasing the risk by decreasing the number of flights (this one still involves reaching an agreement for the use of Soyuz as a lifeboat in event of an emergency, but would allow the use of shuttle seats as a bargaining chip for Soyuz seats). Not having a choice is what happened from 1975 until 1981, when there was simply zero U.S. access to space. No launch vehicles at all, and no one we could bum a ride from. To a lesser extent, it's what happened from 1986 to 1988; though arguably there was the option of flying with a flawed system, but not launching when it was too cold -- not a good option, and one NASA wisely did not take. There is an American in space right now because NASA did have a choice. By cultivating an international space partnership, the U.S. is able to take advantages of capabilities of its partners to supplement its own. More options, not fewer. And, as a result, the U.S. has maintained continuous human presence in space for the last three years when it would have otherwise been difficult or impossible. Personally, I see that as a good thing, not a bad one. I found an article that has more information about the "hyperdrive" engine that I posted about yesterday. The additional details make it sound even more incredible, in both senses of the word. Professor Jochem Hauser, one of the scientists who put forward the idea, told The Scotsman that if everything went well a working engine could be tested in about five years. OK, I told you to take the recent Russian article about the alcohol ban on the international space station possibly being lifted. "We � NASA � have not changed our policy regarding alcoholic beverages on an operational spacecraft," he told me in response to the Interfax report. "We do not endorse that, nor do we execute that manifest." Navias said "there's no debate" with the Russians on that point. And he disputed Interfax's claim that a recent cargo shipment to the station bent the rules by including some "chocolate liqueurs" (or would that be liqueur-filled chocolates?) for station commander Bill McArthur. It makes one wonder, though, exactly how the ISS partnership works, that one partner can unilaterally ban something for everyone, if that's in fact what's happening here. Want to work for NASA, but don't want to have to get out of bed? Today is your lucky day! Participants are currently being sought for a 115-day bed-rest study that will help NASA learn more about controlling physical atrophy in spaceflight. Participants will spend 90 days almost entirely in bed, lying slightly tilted with their head lower than their feet. According to another report, the engine would "create an intense magnetic field that would produce an anti-gravity force and propel craft faster through space" (Assuming that's the same one. This article also mentioned other dimensions, but I don't know enough to understand why other dimensions are involved in that explanation.) That report also says a round trip to Mars would be cut from 2 1/2 years (A long figure, based on staying from one opposition to the next -- the actual travel time each way is "only" six months) to five hours. 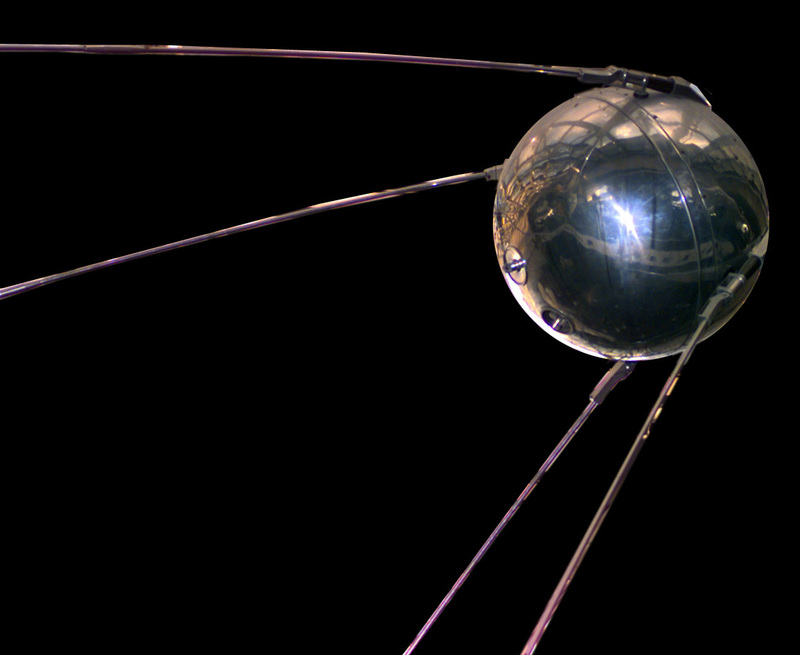 On this date in 1958, having successfully changed the world, Sputnik 1 reentered the Earth's atmosphere after 92 days in orbit. Er, also, Spirit landed on Mars two years ago yesterday. 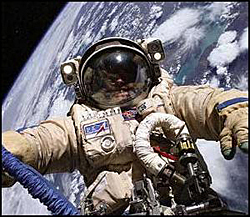 + 0 - 0 | § ¶Space Alcohol Ban To Be Lifted? A ban on alcohol aboard the International Space Station (ISS) could be lifted in 2006 to allow crews nips of liquor after grueling work assignments, Russia�s Interfax news agency reported on Tuesday. 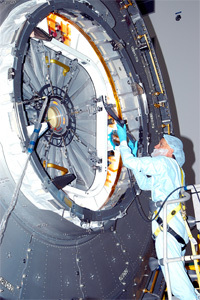 With ESA's Thomas Reiter still scheduled to become the first non-American-or-Russian spacefarer to make a long-duration stay on the International Space Station at whatever time the space shuttle resumes flying again, plans are already way for yet another agency to be able to have a representative live on ISS. An astronaut from the Japanese space agency JAXA is already in training for a flight to the ISS. Plans are for two JAXA astronauts to make long-duration stays while the Japanese Experiment Module, Kibo, is added to the station. Work is expected to begin in 2007 and conclude the following year. A naval aviator who helped deploy the Hubble Space Telescope, a pilot who flew the fourth and final orbital test flight of the Space Shuttle Columbia and an Air Force test pilot who was at the controls of the first international Spacelab mission will be inducted next year into the US Astronaut Hall of Fame, the organization responsible for their selection announced on Friday. The Astronaut Scholarship Foundation named Charles F. Bolden, Jr., Henry W. "Hank" Hartsfield, Jr. and Brewster H. Shaw, Jr. as the 2006 class of Astronaut Hall of Fame (AHOF) enshrinees. The three mission commanders will be the fifth group of shuttle astronauts to be honored and will join all Mercury, Gemini and Apollo veterans inducted since the Hall opened in 1990.